Lest you ever look at sweet little Quinn with his flowing golden hair and blue eyes and delicate limbs and question if he is my child...wonder no more. 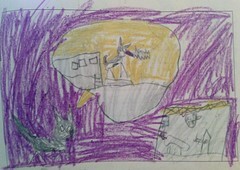 He wrote the following story for school, which, let's be honest here, I could have written just for this blog. Evidently, the story is supposed to be "realistic fiction," so you can either ignore the fact that the cats talk or, as Quinn explained to me, understand that when they are talking to each other, what we hear are meows and mews. 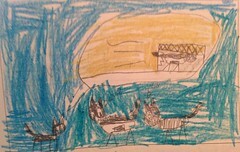 Quinn's story is reproduced here not just with his permission but with his unadulterated glee. 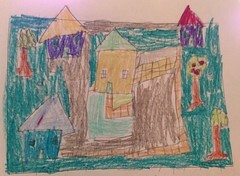 Quinn's illustrations appear before the text (in quotation marks) that goes with them. 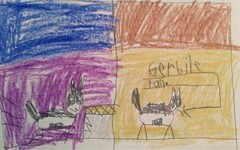 "The story is about 3 cats trying to get to 3 gerbils. The gerbils are: gerbil #1, gerbil #2, and gerbil #3. The cats are Oreo, Ruby, and Starfire. Oreo and the others want cat food—gerbils if possible." 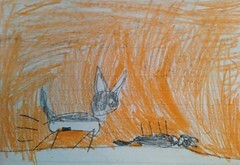 "Oreo said, 'If we want the gerbils, we need a chainsaw.' 'Let's just have cat food,' Ruby said. 'Let's worry about the gerbils later.' 'Okay,' said Starfire." "After Oreo and the others woke up, they went to the gerbil cage. Oreo said, 'Let's get the chainsaw.' Ruby said, 'Yeah, not gonna work.'" "Starfire said, 'Guys, I have a...whoa!' Then Oreo says, 'Let's save it.' Meanwhile Starfire was grumbling on the floor because she got pushed by Oreo. Ruby said, 'That was weird.'" "'The idea...' said Starfire, 'is Oreo rams the cage with full power.' Ruby said, 'It's night. The prey is awake.' Ruby was right." "Oreo then smashed and completely destroyed the cage. And soon they were munching and crushing on meat. Gerbil meat. Then they went to bed." Jack’s special hockey team, the Montgomery Cheetahs, is still soliciting donations for their big fundraiser coming up in May. You can make your own donation online. One of the best things I've read in a long time!! Go Quinn!! 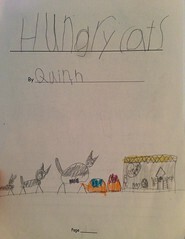 Awesome, Quinn! I always wonder what cats are saying to each other, now I know. I thought it was neat that you coloured in the whole page too. Chainsaws! Always an excellent literary device! A budding best selling novelist. Also, I, too, like the Oxford comma. Sooo, Quinn left out the last page, where Oreo wakes up and it was all a dream. Right?!? Also, based on story line, Oreo is impulsive, Starfire is smart, and Ruby is sensible. Kudos on the Oxford comma. I'm not sure whether it's required, so I use it inconsistently. Actually, I DO use the Oxford comma. It is "a, b, and c"; not "a, b and c". Because "a, b and c" makes it look like b and c are grouped in some way. The gerbils are doomed. Also, get rid of all powertools immediately. I sometimes pet sit guinea pigs, but I haven't done so since I've had these kittens. I'm curious to see how it will go. I'll let you know if they too can fit their mouths around them. I believe that the purpose of commas is to improve clarity, something the Oxford comma does very well for many reasons, including the one you mention. LOL! Well at least nobody can say he doesn't have a vivid imagination! This kind of reminds me of the time when, in first grade, my brother's class had to write a non-fiction story of something that had happened to him. My brother wrote about being a soldier in the war and having his leg blown off. His teacher called him up and told him it was an interesting story, and he was very brave to have fought in the war, but if his leg got blown off, how come he was standing on two legs right now? My brother told her, "I have a fake leg." And she very kindly pretended to believe him!